It is a good time for woman of colour in the modelling and fashion industry at the moment. Jourdan Dunn has become the first black model to grace a solo UK cover of Vogue in 12 years!! It is unbelievable that in this day and age we are still writing about this as a momentous occasion. 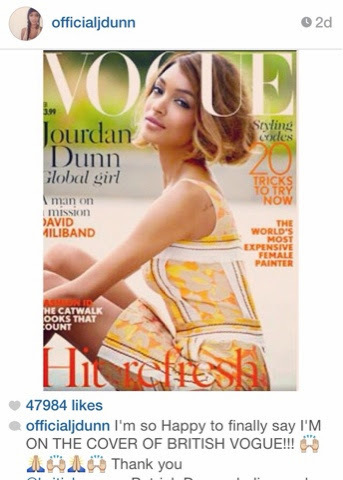 A screenshot of an excited Jourdan Dunn's Instagram message to her followers. That is quite an eye-opener and one that I must admit I wasn't even aware of. What is apparent though is the lack of female black models on the runway and for major fashion brands. Apparently Naomi Campbell, Iman and Bethann Hardison amongst others, penned an open letter to The British Fashion Council in 2013 raising the matter and their concerns (below). No matter the intention, the result is racism," it read. "Not accepting another based on the colour of their skin is clearly beyond aesthetic when it is consistent with the designer's brand. Whether it's the decision of the designer, stylist or casting director, that decision to use basically all white models reveals a trait that is unbecoming to modern society. 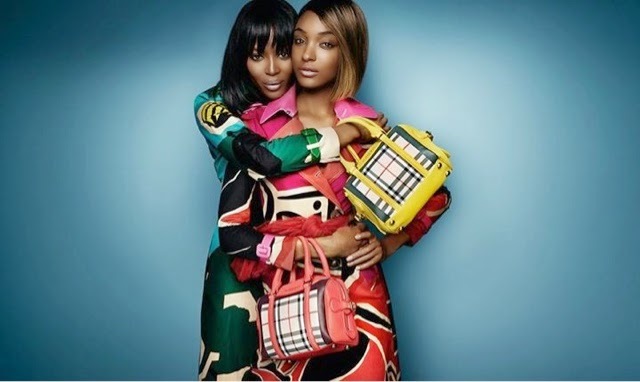 Hopefully, things are changing though and I am so happy to see that the iconic British fashion house Burberry, has used not one but two black models to front their Spring/Summer 2015 campaign. Naomi Campbell and the lovely Jourdan Dunn were chosen by Burberry's Christopher Bailey to fly the flag and they both look amazing (below). I felt a real sense of pride seeing this campaign and almost felt like it was very symbolic - almost as if Naomi is now handing the 'Supermodel' baton over to Jourdan. I really hope that this isn't a one-off and we will see more of this representation across the fashion world soon. I'm off now to buy my copy of Vogue - make sure you get yours too!...Buy two or three even and give it to a friend! Lets make this issue one of the biggest selling and show that fashion sells no matter what the skin tone of the model is!! Hi Fiona, you're very welcome and thank you for reading and posting a comment! You are very right and hopefully we will see more changes sooner than later.